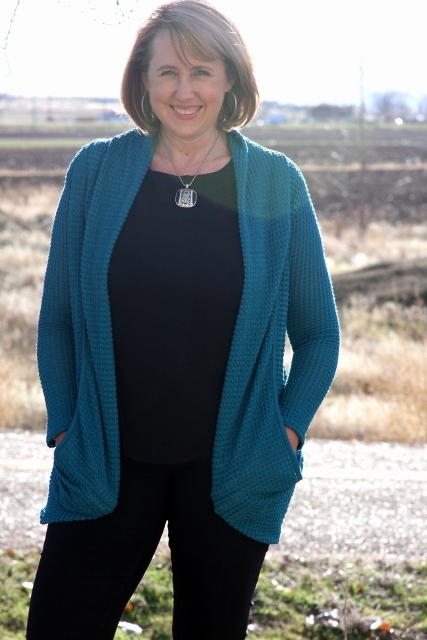 I thought I’d share my latest Stitch Fix goodies with you this morning. First up is this black chevron skirt and black short-sleeve blouse. The skirt is pretty, but it was a little short for a maxi on me– it almost felt like petite sizing– and is similar to another skirt that I already own. The blouse is a nice light-weight under-layer. As I was putting it on, I was thinking of all sorts of ways it could be useful in my wardrobe, and my daughters thought it was a nice flattering fit. The dotty blouse is one that I would not have looked at twice on a rack. But I ended up liking it a lot more than I expected. Looking at the photo, I wish I had not paired it with that scarf. What kind of jewelry would be good with it instead, do you think? I have a hard time with accessorizing. The plaid sweater is absolutely gargantuan. It made me feel so wide putting it on, and I kept trying to arrange the big floppy collar in a way that didn’t show the inside of the knit. But it really wouldn’t behave. My son took one look at it and declared it to be a tablecloth. On the bright side, the bigness of the sweater makes my legs look skinny. This turquoise cardigan was one I knew I’d keep the second I pulled it out of the box. I love the way the collar drapes down and creates pockets at the bottom of the sweater. 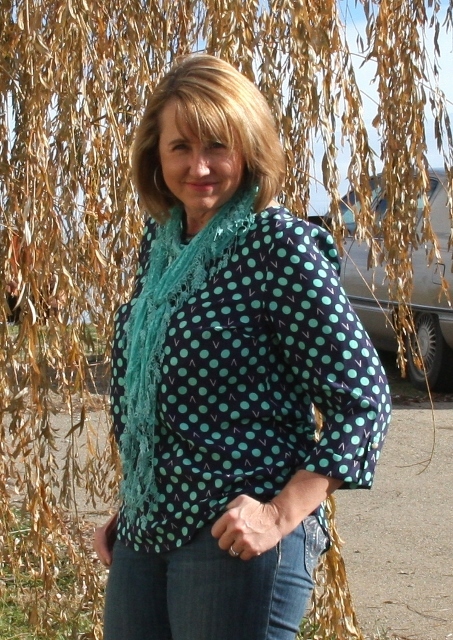 Besides the turquoise cardigan, I also ended up keeping the black blouse since it was such a nice layering piece, and the dotty blouse because it was different from anything I already have. All in all, it was an interesting batch of clothes. Here’s my affiliate link if you’d like to try Stitch Fix. It’s a lot of fun to see what the stylists pick for you, and if you give them more info (I shared my pinterest style board) the better your fixes can be. They also have gift cards that would make it a fun Christmas gift. And if you refer other people to Stitch Fix, you can earn credit to apply toward your fix, which makes it a lot more affordable. Love the cardigan & the skirt/blouse ensemble! I do as well. I think maybe Mary would like the scarf with the top better if it was paired with a skirt, and maybe a casual chunky necklace when worn with jeans. Sorry, thought I clicked on reply to vickike crouch. I actually like the dotty blouse with the scarf! Cute colors! I agree on the scarf. I really like it. Me, too! Love the scarf with it. It really makes the outfit pop! Oh, I love that last one the most! I *love* the black outfit with the cardigan! Looks fabulous on you! I liked the scarf.I thought it was a really good match to the shirt. Everything was pretty but I agree with your son about the “table cloth”. He named it well .lol! When you post these, I try to look at just the photos and form my own opinions before reading what you said about them. The chevron skirt looks ok here, but that style/pattern has a tendency to make fuller figures look quite wide, and I know you have had concerns about that in the past, so I wondered how that really looked in person. I liked the dotty shirt, and I totally loved the cardigan. The “tablecloth” is just hideous. By the way, your hair looks lovely. Nice cut, pretty highlights. Thanks for the feedback, and the jewelry hints! And the hair compliment. 🙂 I was really happy with the way it turned out too. I love the dotty blouse, too! And I think the scarf looks great with it. I love everything you chose, and I love the blue scarf with the dotty shirt! I didn’t like the maxi either! They shouldn’t have used that print on stretchy skirt without gores. Also, your hair cut is so cute! This was the best box you’ve gotten, IMO. You look gorgeous in the blue cardigan! So pretty. Love the turquoise cardigan! It drapes so nicely and is very flattering. Ha! I can’t imagine what body type would look good in that tablecloth — what an odd piece. Everything except the tablecloth looks great on you. Good choices! A little hint for you – you should list the name of the items you get exactly as Stitch Fix names them. I know that when I am waiting for a new box, I will google the names of the items I am waiting for. That might help drive more traffic to your site! P.S. This was the best fix you have received by far! what is the name of that cardigan? I’d love to request it for my next fix thanks! Kelly, It is the Abrielle waffle weave cardigan.